The Federal Reserve has positioned itself to sharply slow the pace of rate hikes this year. There even exists a scenario in which the December 2018 rate hike was the last of the cycle. That said, the Fed still anticipates the economy will need some additional tightening to reach their goals of low inflation and maximum sustainable employment over the medium term. Ultimately the path of rate hikes is data dependent, and that data yet to lead central bankers to the conclusion that rate hikes are now off the table. With the December rate hike, policy rates at 2.25% to 2.5% now touch the bottom end of the 2.5% to 3.5% range of neutral rate estimates. Hence, policy may now be neither accommodative nor restrictive. 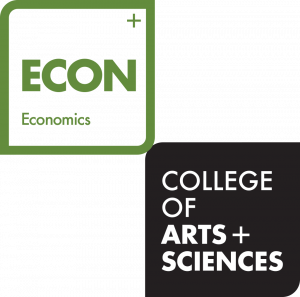 Because of the imprecision of neutral rate estimates, however, policy makers do not know exactly the level of accommodation their policy provides. Consequently, they will need to rely even more heavily on the data flow as a guide to the appropriate policy stance. Indeed, Federal Reserve speakers have made it clear that they will be very sensitive to incoming data in the months ahead. 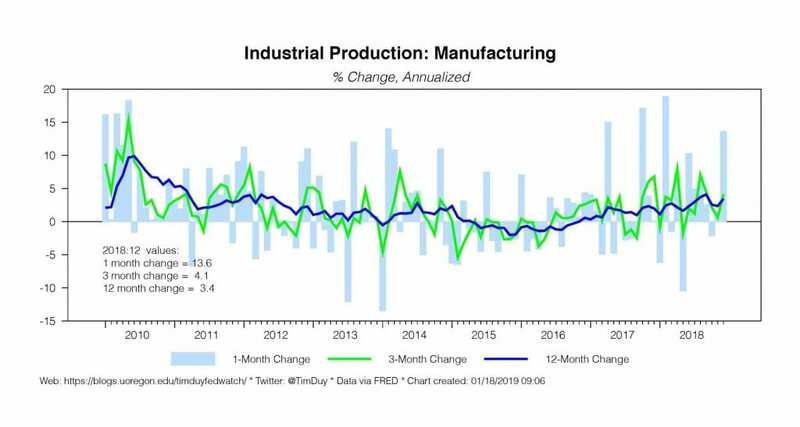 Last week, Chairman Jerome Powell reassured market participants that he recognized the downside risks reflected in recent equity price declines and, perhaps more importantly, that with inflation still low the Fed can afford to be patient before implementing further rate hikes. What does this mean for the path of policy going forward? The ability for the Fed to remain patient means that in the near term there is no longer an immediate need to hike rates. While the Fed’s interest rate forecasts still anticipate another two 25 basis point hikes this year, those hikes do not need to be front loaded. The Fed can sit back and review its handiwork, waiting for the lagged impact of past rate hikes to filter through to the economy before taking further action. That said, the data will still be relevant. 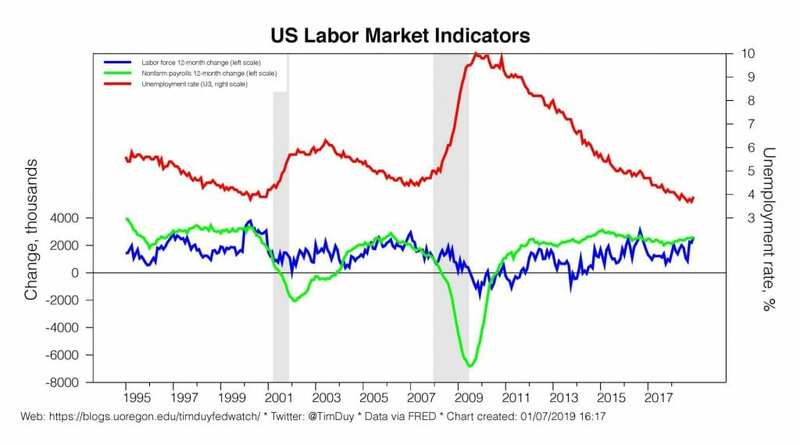 The mix of data that keeps the Fed from hiking while retaining a bias to hike is best described as a combination signaling that growth will decelerate relative to the rapid pace of 2018, labor market outcomes point to fairly steady unemployment, and inflation remains low. 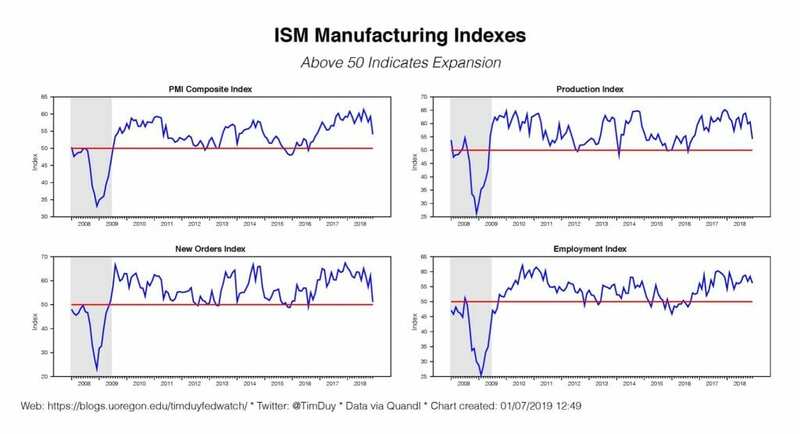 Countering the ISM manufacturing weakness, the employment report revealed a strong job market with a blowout gain of 312,000 employees for the month. 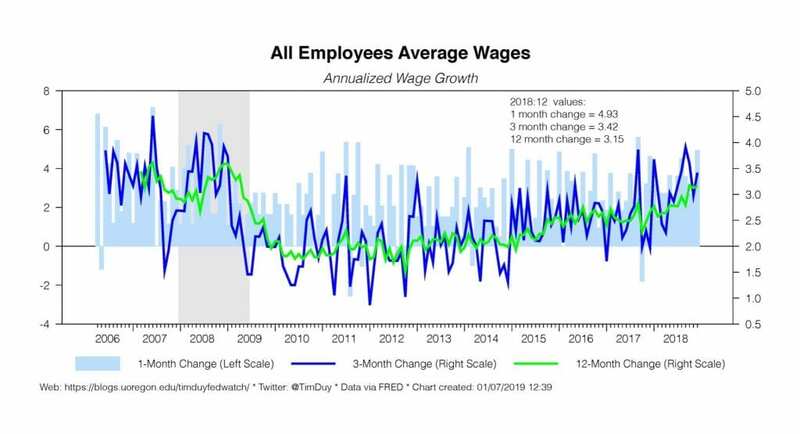 I have to admit I am uncomfortable expecting the Fed to delay a rate hike until the middle of the year when employment growth remains on an upward trend. The only saving grace is that the economy delivered the workers necessary to keep pace with such growth.The unemployment rate actually ticked up to 3.9%, leaving it effectively unchanged over the past six months. 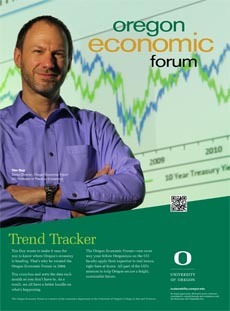 In turn, continued stable unemployment will reduce the chances that the economy is overheating. Inflation is thus likely to remain in check. 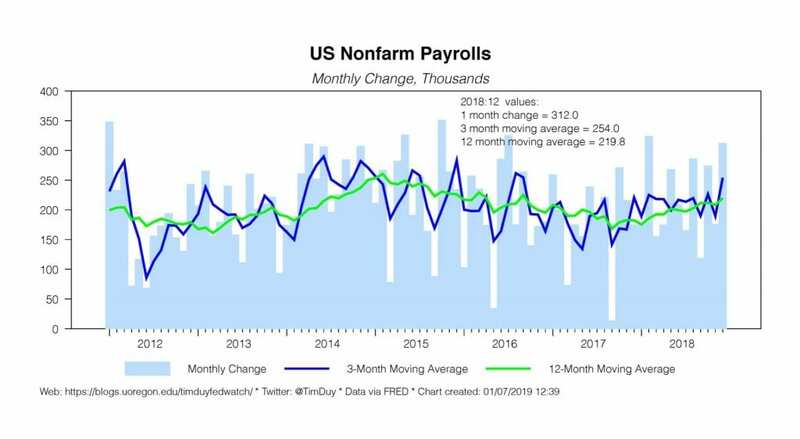 Assuming December job growth is an outlier and will pull back in the following two months, the data flow will likely be sufficiently softer to keep the Fed from hiking in March – but they would retain a tightening bias and would likely hike again mid-year. This would be consistent with the forecasts presented in their Summary of Economic Projections. 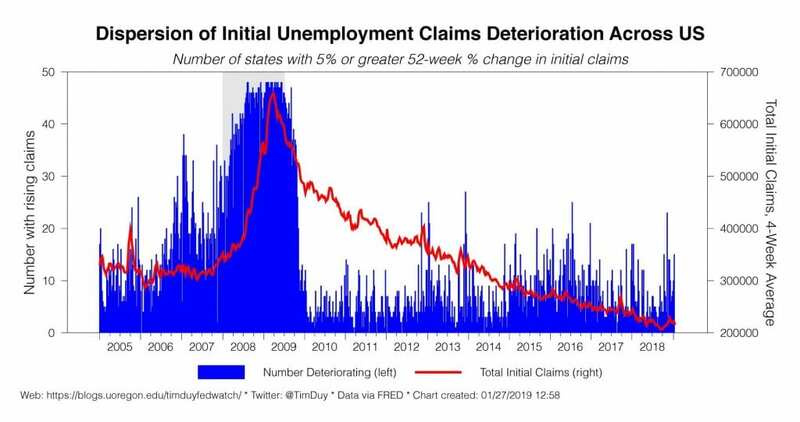 They will fear that eventually job growth that consistently exceeds 100,000 each month would eat up enough upward slack in the labor market to push unemployment sharply lower. They would be inclined to snug up a policy a notch to prevent that outcome. 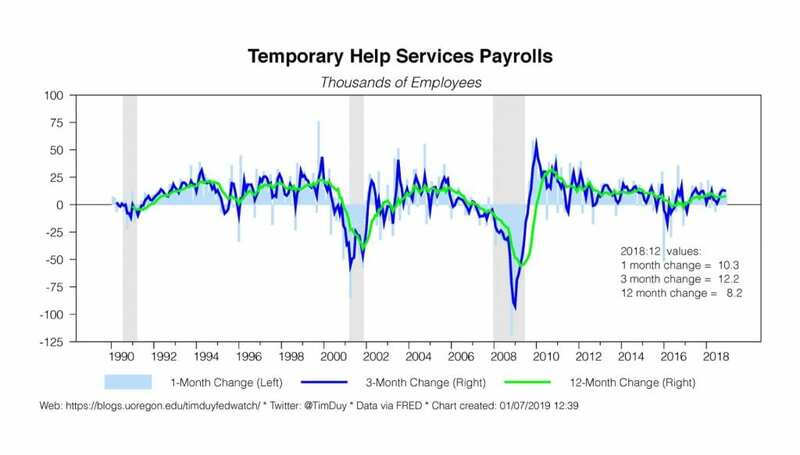 If conditions arise that slows job growth toward 150,000, they will push any rate hike back further in the year. If the economy slows more than expected and job growth heads for 100,000, the Fed will move off the stage entirely. Remember, these scenarios assume inflation remains contained. My general rule is this: The Fed will choose recession over inflation, but as long as inflation looks to hold sustainably near the Fed’s target, there will be a “Powell put” on the economy. 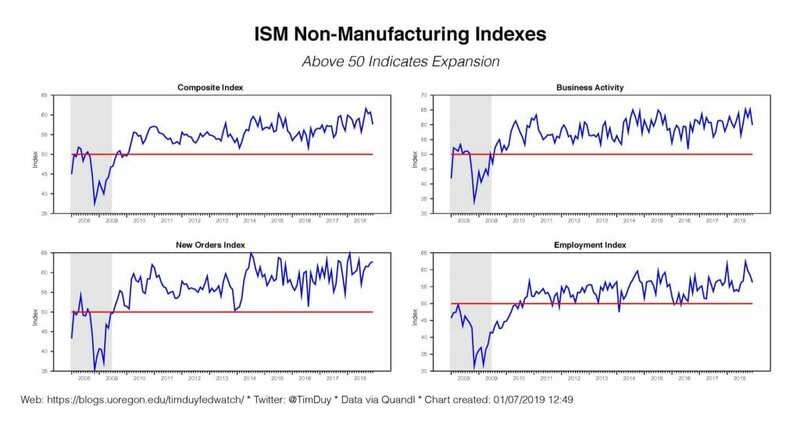 That’s something to remember when wrestling with the recession calls that have grown louder in recent months. If you aren’t recognizing that absent inflation the Fed has the ability and willingness to cushion the economy against shocks that could threaten to send growth sharply lower than expected, you are doing it wrong. Bottom Line: Low inflation means the Fed can move patiently. They don’t feel compelled to maintain the pace of quarterly rate hikes. Still, that doesn’t mean they won’t. 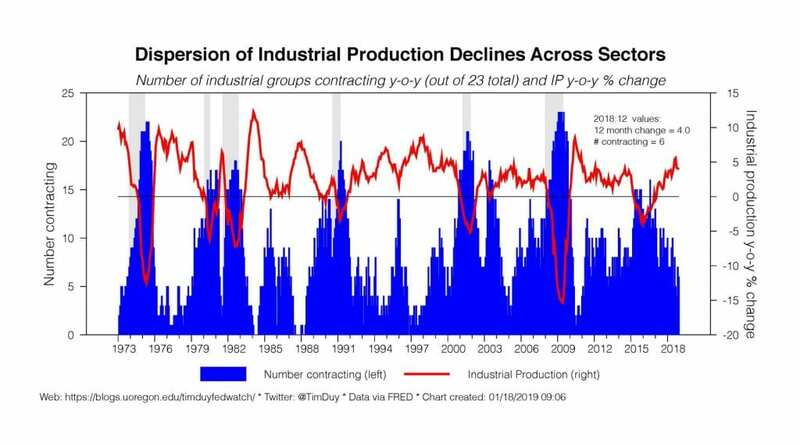 My baseline expectation is that the data flow remains sufficiently soft and economic uncertainty sufficiently high to keep the Fed on the sidelines until at least mid-year. There is a chance of course that the correction in equity markets has left us all too pessimistic about the outlook for growth and inflation this year. If so, Fed commentary might turn hawkish again sooner than I anticipate.